Do something unique and go where few other tourists get to experience. 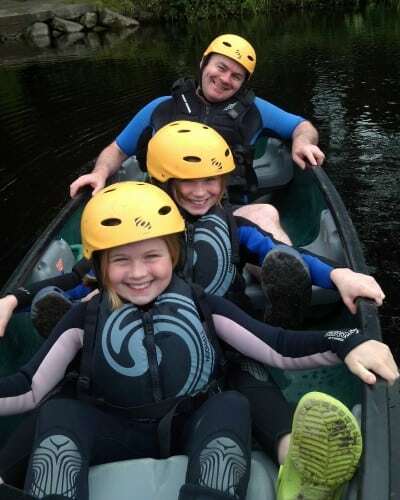 Choose one of our half or full day activity excursions and spend some quality time paddling some of the most enchanting waterways in Ireland. 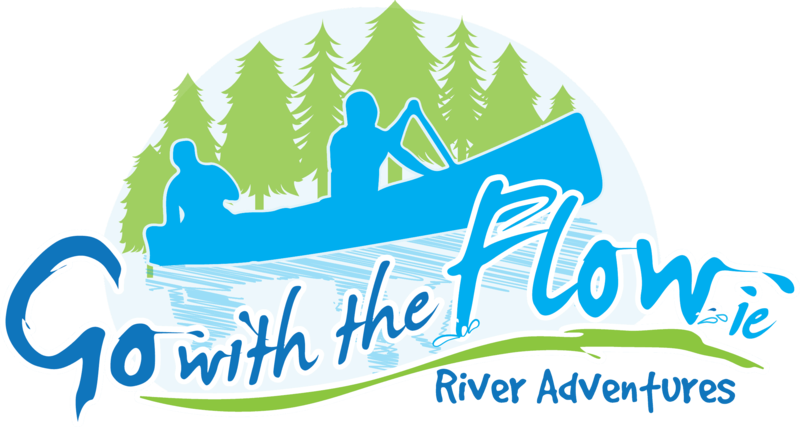 Go With The Flow adventures take you into beautiful, unspoilt and exciting waterways. Our instructors will guide you along exclusive trails and show you how to shoot weirs and ride the rapids. We will pass through dramatic landscapes, mysteries wooded valleys and old navigations once used by the Guinness barges to deliver Ireland’s favourite tipple. You can bring a picnic, visit the playground of The Incredible Mr Kavanagh and take a swim in tranquil sheltered waters of our favourite remote pools. Make your dream a reality – get the gang together – Book Now! If you’re keen to get the family active in outdoor activities – Someday is now. Don’t just sign up for any old canoeing activity. Go With The Flow River Safaries are the adventures you dream of. An absolutely incredible afternoons fun. Literally could not fault it on anything. All gear supplied, really comprehensive safety training beforehand and ideal changing facilities. Charlie also has the patience of a saint. Despite a member of our group capsizing every 20 seconds, he remained professional and understanding throughout. Would return tomorrow in a heartbeat. Hi Charlie and Rachel Thank you for a fantastic day on Thursday Mark Kai and I loved our day hoping to come back in the summer have told all our friends about such a fantastic day.Since we’ve come home have been in Oysterhaven with Kai looking at canoes.It made our Easter Holidays Thank You. The next morning, after a big breakfast, we set off for our second hotel-organised adventure – canoeing. We drove to pretty Borris in Carlow, where Charlie Horan, who has run Go With The Flow for 20 years, brought us to Clashganny. Charlie looks like he loves the outdoors. But not only is he passionate about canoeing, he is a font of knowledge on local history. Slapped into our supplied wetsuits, Charlie gave us detailed instructions, but ensured we were excited, rather than apprehensive. He took the two kids in one canoe; my wife and I went in another. I was at the back steering, or attempting to and soon after, we took our first weir. It was exhilarating. The kids screamed and burst with excitement. We paddled along the Barrow and crashed and bounced through some white water. All the time Charlie had us under his quiet, but assured, control, peppering his advice with humour and historical nuggets. One of the highlights was going through some locks, which Charlie had to open and close and guide our two kids as they canoed their own way through the gates. At one stage , this time my wife steering, I hasten to add, we started to go in the wrong direction. We burst out laughing. But after many minutes, a certain edge crept into our voices. When we eventually sorted ourselves out, Charlie told us these canoes are called “divorce boats” in the US. It was a memorable experience for us all – and one we will certainly repeat. Afterwards, we had a hotel-supplied picnic beside the beautiful nine-arch bridge in scenic Goresbridge village. And then home. Happy campers. “Thanks for a great day yesterday, I’m going to pass the photos on to Dáire, he’ll love them! He had a great day, really enjoyed the white water and was amazed at the peace all around. His comment “you’d get a great night’s sleep here, until the birds woke you up” says it all. He also told his Nana that he’d go back again Praise indeed! I’ll definitely be passing your website on to our ‘week-end away’ co-ordimator in work, and you never know, maybe we’ll be in touch again. From the moment I spoke with Charlie in December last, it was very clear that he was as enthusiastic as I was to pull off a surprise 60th canoeing birthday event in Graiguemanagh for Tommy Forristal. Charlie was so positive, honest and detailed in his emails and website, I felt we had all the answers to undertake this. So 16 crazy and equally enthusiastic family and friends were tutored, encouraged, and helped by the GOWITHTHEFLOW team of Charlie, Rachel and Ken on the day. The general view as we sat in the most delightful Mullichan cafe in St. Mullins, amid nourishing soup and toasties ,was a resounding successful day out with GOWITHTHEFLOW.